On Sunday, August 7th, 2016, Outpost Zeta hosted its first VHS_Party as part of VHS SUMMER. Ever since I started looking more into VCR culture and the people who collect it, I’ve seen fun events spring up around the U.S., complete with tape trading and movie screenings. I started looking for venues that would work within the O/Z budget (i.e. free). Not much response at first, but thankfully a local venue called Vega got in touch with me. They had a date open, but it was only two weeks out, so I had to scramble to make sure we had everything we needed. With assistance from nerdyvinyl and Soft Sandalwood, we set up a Facebook event page, did some cross posting, and bothered friends about it. 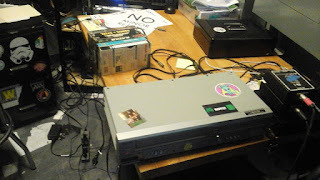 I had to do a quick tech test (I had to get a component to HDMI converter) and prep a few tapes. My goal was to run the entire event from video tape, I could have cheated and used VHS rips from a laptop, but it was my first time out and I wanted it to be authentic. We opened the night with a fifteen minute slideshow of VHS covers ranging from beautiful to lurid and often both at the same time. I set it to music from NewRetroWave’s Crypt EP. We also screened a video by Com Truise, and finally a little Simpsonwave. Following that, there was a short feature, Creepy Classics (1987). This is a thirty-minute tape made by Hallmark which was sold with a purchase at their stores. The video features Vincent Price introducing an assortment of horror film trailers and movie clips from the 1950s and 60s. The selection was pretty well trod ground, but Price is always a complete delight to watch on screen. He gave it his all, even with something as disposable as this tape. The strangest part of this video is the fact that it pretty much shows the entirety of Christopher Lee’s killer severed hand segment from Dr. Terror’s House of Horrors (1965). Our feature presentation was one of my favorite movies, Hands of Steel (1986). A dystopic action extravaganza that combines, cyborgs, arm-wrestling, and writing things on toilet rolls in a way that only Italian genre cinema can do it. I know that Code Red has plans to release this on Blu-ray, and I’m excited to see it cleaned up, but it does possess a low rent grungy charm that compliments VHS perfectly. 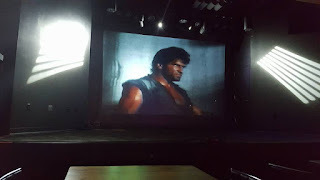 The audience (All fifteen of them) wanted more, so without much hesitation, I introduced (and re-introduced to some) the joys of Alien Warrior (1986). This science-fiction/kung-fu/gangsploitation/religious action comedy is one hundred minutes of confounding acting, direction, and script choices. Best of all, it only exists on VHS where it belongs. Everyone seemed to enjoy the evening. They drank and ate lots of food, which should make the venue happy. They cheered and yelled at the screen, which makes me happy. I had brought some tapes to trade, but we didn’t have any other tape traders arrive, hopefully next time. The Wal-Mart Special makes its first public appearance. Did I say next time? Yes, I did. I’m happy to announce that Outpost Zeta will holding its next VHS_Party on October 17th, 2016. Follow the O/Z Facebook page so that you don’t miss out on the official event. Thanks to everyone who helped, and thanks to everyone who came down to watch.